In 1978, when I was twenty-one years old, I won an all-expense-paid tour of the USSR in an essay contest sponsored by Radio Moscow and the Sputnik Youth Organization. In Moscow, well before the advent of the greater freedoms evident in the country today, I was greeted with an incredible maze of intimidating red tape. The unbelievable hassles and confusion caused by bureaucratic foul-ups made my journey seem to me like a Marxist comedy of errors, more reminiscent of the Marx Brothers than Karl Marx! To my delight, he offered immediate exchange, giving me 1,000 rubles in exchange for my $312 in American Travelers’ Cheques. I was now ready to shop in style in Russia! At 5:43 P.M., our plane taxied down the runway. My one consuming thought was, I hope there’s a Sputnik rep waiting for me in Moscow. Almost sixteen hours later, we landed at Sheremetyevo International Airport, outside Moscow. Disembarkment was followed by the interminable hassle of visa, passport and customs inspection. We were required to report any Russian currency in our possession. The Customs Declaration Form stated: “I have on my person and in my luggage the following: 1. Currency and currency equivalent: (a) U.S.S.R. currency _____.” I boldly recorded “1,000 Russian rubles,” then handed the form to the young female attendant. With an incredulous stare, she inquired, “But don’t you know it’s illegal to carry Russian currency from another country into the Soviet Union?” She added calmly, “If you hadn’t reported it and it was discovered, you would’ve been eligible for an immediate ten-year prison sentence.” She called a teenager who, in turn, called an aging, bald, moody man, who made it clear that bargaining was not an option. “Pass over the money,” the female demanded. Only the Canadian Embassy can help me now, I thought. After my luggage was searched in detail, I went to the nearest telephone and called the embassy. I explained my situation to the sole official on duty. “Unfortunately,” he said, “our offices are closed for Sunday. Call back tomorrow.” What to do until then? Where’s that Sputnik rep? I wondered aloud. Vladimir finally arrived–two hours after I did! “Sputnik is not expecting you,” he assured me bluntly. Evidently, nobody in Russia was aware of my arrival. Forty minutes later, I entered the hotel. In an upbeat voice, I said to the receptionist, “Sergei.” She gazed laconically at me, slowly shaking her head. I was in the fourth-largest city in the world, a city of close to seven million people, and I couldn’t make contact with anybody. I couldn’t speak Russian. On a slip of paper, I penned the Russian words for “to speak English” and passed it to the receptionist. Another blank stare. I’ll have to contact the embassy again, I told myself. I wrote the word for “telephone” on a scrap of paper and showed it to a policeman. He disinterestedly pointed to the instrument. To my chagrin, I suddenly realized I had no rubles to make the call! There was, I decided, no way to contact “Sergei.” I sat in the hotel lounge and thought and prayed. Moments later, I spied the bus driver who had driven me to the hotel. I quickly dug into my pocket for the embassy address. I showed it to him and, at the same time, displayed a handful of Canadian coins. Pointing to his bus, he offered to drive me to the embassy. The embassy door at 23 Stariokonyushenny Pereulok was a welcome sight. Inside I told my story to one man, then another. It was too late to speak with the folks at Radio Moscow and I didn’t have anywhere to spent the night. A Canadian secured a hotel room for me and loaned me ten rubles. 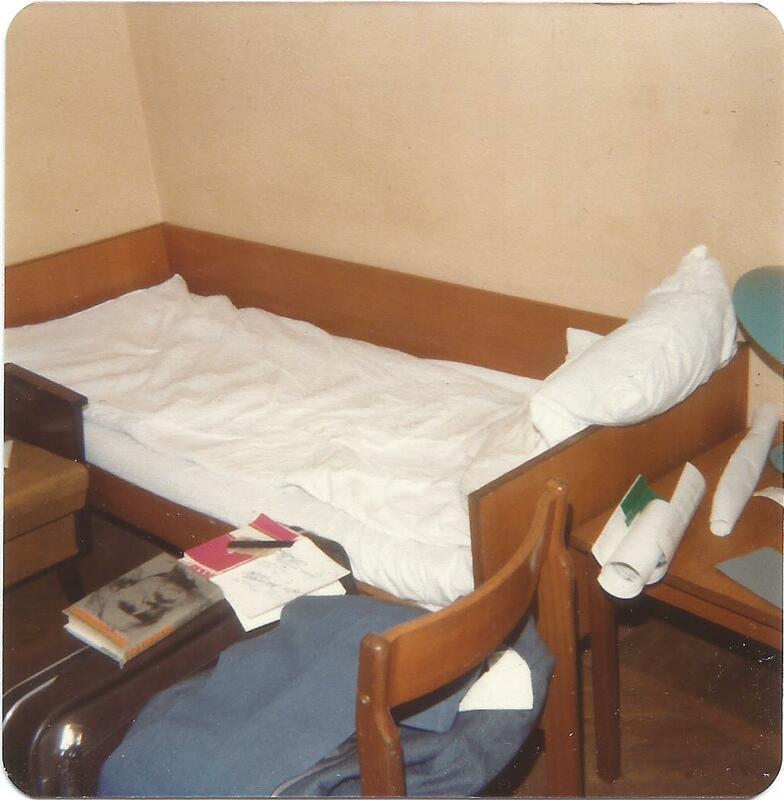 I careened to Hotel Ukraine in a black station wagon, driven by a Russian. I jumped into bed and slept for six hours. Once awake, I became very lonely…and scared. On Monday morning, I left the hotel and caught a cab to the embassy, where I was met by a host of friendly faces. I rehearsed my story. They made several phone calls on my behalf. Radio Moscow was adamant that I had not won the trip. “No one ever wins a trip from us!” they declared. The first secretary and consul at the embassy read to the Russian the letters I had received from Radio Moscow. At this revelation, my Canadian friend boiled over and, in language that turned the air around me blue, harshly demanded immediate action. His pressure resulted in grudging progress. I was told that later that day, I would be traveling to Leningrad to begin my tour. The Canadian Embassy had become my personal haven, my Shangri-La, my home away from home. Since then, many What if? questions have arisen in my mind. The answer to each one goes back to the debt of appreciation I feel for the Canadian Embassy in Moscow and their personal care for me at a time when my future looked so foreboding.